This combination rake and golf ball retriever is all in one. Just in case you go in the water, use the rake to bring the golf ball closer and the retriever to pick up the ball. -Portable, durable, and light weight. -Extends to 7 ft. and retracts to 34 in..
-The retractable rake and golf ball retriever is for use on all golf carts. Dealers who purchased the golf cart rake and ball retriever were also interested in the club and ball washer, the sand bottles and the golf cart coolers. Granby Trading Co., Inc. offers a full range of golf cart accessories and golf cart parts. 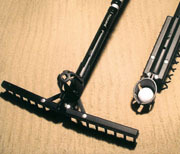 The golf cart combination rake and ball retriever is a convenient accessory to take with you to your golf game. Click on any of the golf cart products on the left to get full details and descriptions. We work with golf cart dealers only and provide responsive, quality service. You can be assured that we will deliver the best golf cart accessories available.